Choroidal melanoma is a cancer that affects part of the eye. It develops in the choroid, the sponge-like membrane at the back of the eye between the sclera (the white of the eye) and the retina. 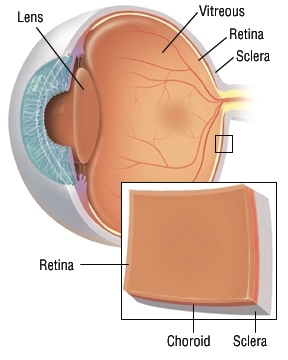 (The retina is the light-sensitive structure at the back of the eye. It sends visual information to the brain.) The choroid is rich in blood vessels and supplies nutrients to the retina.